At age 12, Clay Cardwell discovered the magazine Fangoria. His desire to replicate the costumes depicted in its pages led him to help run the Jaycees’ haunted house in his native Dothan, Alabama. 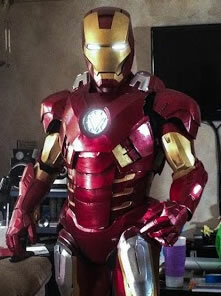 There, he developed his costume and prop-making skills such that, by the time he graduated high school, he was lead costume and prop creator, as well as designing the house’s rooms and path. In April 2013, Clay bought a Rostock Max 3-D printer from SeeMeCNC for $1000. (The Rostock Max is the top of the line of SeeMeCNC’s kit printers; the company also offers its fully-assembled Orion 3-D printer for an additional $500.) With it, he can produce the finger joints, hand plates, and palm pieces for Iron Man’s repulsor gloves, as well as the pendant from Harry Potter and the Deathly Hallows, the Hyrule family crest from The Legend of Zelda, and the four-part thermal detonator from Star Wars – all from a $40 one-kilogram spool of 1.75mm diameter ABS filament. Each inch of filament yields over three inches in costume parts; after a little more than six months of using his 3-D printer, Clay has just started using his second spool of filament. To design these various parts, Clay currently uses freeware versions of programs such as Google SketchUp, Blender, and 123D Design, although he is looking to buy full versions of some of these. He also uses NetFabb’s Cloud Services to plug any holes in his designs that would prevent them from being sliced properly for printing. Once created, designs can be shared on websites such as MakerBot’s Thingiverse, or in the case of Clay’s costumes, at local events such as science fiction conventions and charity functions. In addition to making costumes, Clay renders 3-D pieces on commission and is starting a business to sell costume materials and teach others the fine arts of mold-making, vacuum forming, and 3-D printing. He has been mentioned several times in the Omaha World-Herald during 2013. During April, the Omaha Children’s Museum exhibited 10 costumes he designed for himself and friends; the museum now wants to devote its second floor to display his work – and to have him make a costume for them to own outright. Despite these honors, Clay considers “the best recognition is in the smiles of the kids we entertain at charity events” such as Make-A-Wish and Forever Angels.